We’d love your help. Let us know what’s wrong with this preview of The Invisible Disease by Gunni Nordstrom. This title presents the dangers of environmental illnesses caused by electromagnetic fields and chemical emissions. To ask other readers questions about The Invisible Disease, please sign up. 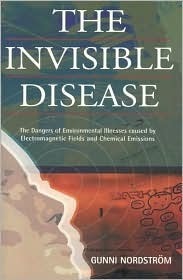 The Invisible Disease explores the potential that electricity, computers, and commonly used chemicals could actually pose a health risk. In fact, the author presents that a growing number of people are becoming highly sensitive to light, electricity, and chemicals that most of us come into contact everyday. Their symptoms range from Are our workplaces and homes making us sick? Has the technology that was supposed to make life easier actually ruining our health? The possibilities are frightening.